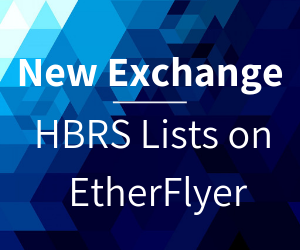 HubrisOne is pleased to announce our second exchange listing in a month, EtherFlyer. Tokens will be available for market buy orders only during the token distribution period. EtherFlyer is a decentralized exchange which was launched in January 2018. It uses hardware acceleration and efficient memory matching technology to make the order matching rate peaks at 2,000,000 TPS and the order processing rate peaks at 1,000,000 TPS. It will continue develop to realize cross-chain transactions between different types of cryptocurrencies. We’re glad to be partnering with a growing exchange.